Rainfall. Moisture stress. Drought. Excess moisture. What a start to the growing season with regards to corn. We all know corn needs a lot of moisture in order to produce the bushels that we expect from the crop. Corn is also a very efficient water use plant for the amount of grain it produces. However, this growing season has been challenging for corn in some areas due to moisture stress. 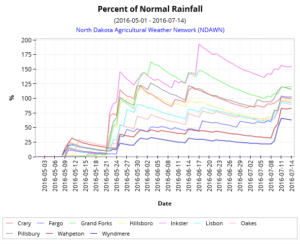 The rains this season have been short in some areas of ND and long in other areas. Here is a snapshot across the North Dakota Agricultural Weather Network for a sample of locations in the largest area for corn production. The results in this figure is the percent of normal rainfall accumulations to date (last 30 years’ average). It would stand to reason that being at the 100% or a little above should be the sweet spot to have adequate moisture for corn production. There is so much to talk about in this figure. The SE portion of North Dakota has been hit hardest by drought, and even this past week’s large rainfalls haven’t brought the Wahpeton and Wyndmere rainfall up to 100% of normal accumulations. For almost 2 months they were below 50% of the average accumulation, dipping as of ND has been very wet, as evidenced by the Inkster and Grand Forks sites. My old boss and current colleague Dr. Joel Ransom wrote an excellent summary of drought stress for corn just this week in the NDSU extension crop and pest report. Here is a link to that article: https://www.ag.ndsu.edu/cpr/plant-science/mid-season-drought-effects-on-corn-07-14-16. It is a very good read for an overview of the physiology behind drought stress in corn. Overall, there is not much you can do about drought or moisture stress unless you grow irrigated corn. However, knowledge of what is happening in your field can always help you better predict for the harvest to come.